One of life’s great comforts is the aroma of homemade soup warming on the hob. 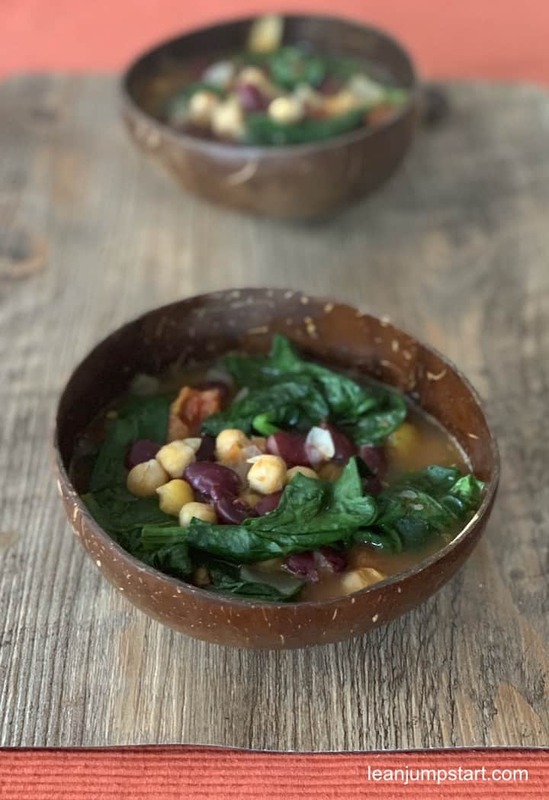 This red bean soup recipe enriched with chickpeas, spinach and nutritional yeast flakes gives you the confidence to create plant based bowls of delicious goodness in your own kitchen. On top of that it is a clean eating meal that can be cooked within 10 minutes. 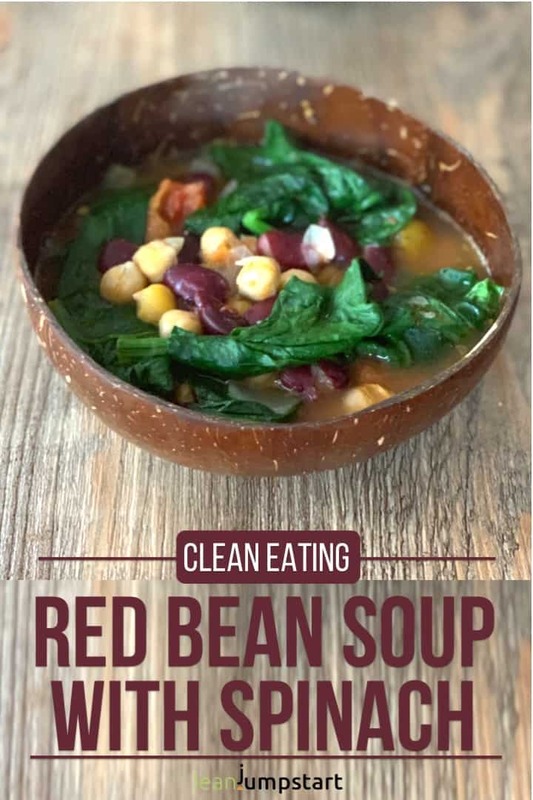 If you are a busy clean eater who is watching her/his weight, this red bean soup is a must-have in your recipe collection. Don’t run away yet, if you don’t have nutritional yeast flakes in your pantry, I’ll give you some tips below, how you can easily replace them. But maybe I can convince you to make them part of your nutrition once you have learned below how healthy nutritional yeast flakes are. But first let’s talk about the recipe. As you might know, we mostly eat soup on Saturdays. Our family rule: The colder the season the thicker the soup has to be. This easy bean soup is a great stand-alone meal and soul food for the autumn and winter season. Warning: Although it is a “slim meal” and perfect for those of you, who are watching their weight, it is at the same time so super filling that you won’t need any whole grain bread you might usually enjoy with soups. After eating this vegan soup for lunch, I could almost skip dinner…This has partly to do with the roughage which is abundant in legumes and don#t forget the fiber in spinach. Click through to learn more about the amazing health benefits of high fiber foods. On the other hand, animal-based products don’t contain any fiber at all. You will also love the fact that most of the ingredients are staples in your kitchen you’ve probably never combined before. …So what are you waiting for? 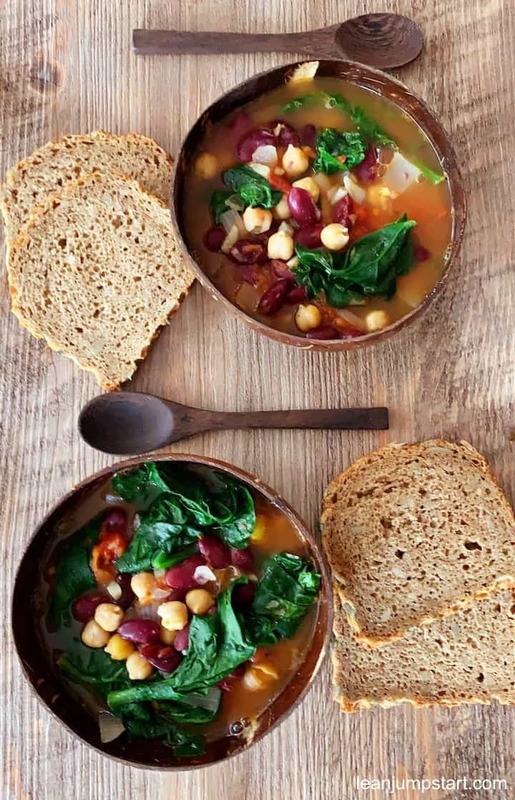 Learn below how to make bean soup and give this vegan dish a try. You won’t regret it! I’ll give you also some tips for a vegetarian bean soup at the end of this blog post. In a large pot or saucepan heat olive oil over medium heat. Steam about 2-3 minutes, stirring occasionally. Add tomatoes, broth, herbs, salt and pepper. Reduce to medium high heat and simmer for 5 minutes, stirring occasionally. Add the beans, chickpeas and spinach, and continue to cook stirring occasionally gently until the spinach has wilted (a few minutes or more if you use frozen spinach pellets). At last add 3/4 cup of nutritional yeast. Season with extra salt and pepper. These amazing flakes taste mild/nutty to cheesy/umami. They give each dish an extra portion of spice and enhance the taste. In the raw food and vegan kitchen, they are particularly popular as cheese substitutes. The best choice for truly healthful nutritional yeast flakes is to choose organic, unfortified stuff (e.g. Sari Foods brand). If you are vegan you might want to use those brands with fortified B12 vitamins. Tip: To preserve as many nutrients as possible use nutritional yeast towards the end of the soup cooking process. You can vary this recipe to your heart’s content. An easy and delicious variation is to leave out chickpeas and double instead of the quantity of red beans. You could also replace them with white beans if you don’t have red beans at hand. What legumes you use is just a matter of preference and convenience. For a kale and bean soup just replace the spinach for kale. You can also replace part of the greens with stripes of green bell peppers. If you are cooking for vegetarians you can use a 3/4 cup of grated Gruyère cheese as a substitute for the nutritional yeast flakes. Omnivores will be delighted if you use grated Parmesan cheese instead of the flakes. I love the fact that legume dishes in general freeze very well and you can let them sit in your freezer for up to 6 months. This is true of course also for this beans and greens soup, which is a great protein-packed meal to have ready to go in the freezer. If you plan to freeze your soup after cooking I recommend to slightly undercook the spinach. I have been eating a lot of soups lately with the weather turning colder and love this idea using healthy ingredients to feel fuller longer. Love the addition of spinach for flavor. This is perfect winter comfort food. Absolutely Ali, you nailed it right. It’s the perfect winter comfort food with a high satiation effect thanks all those soluble and insoluble fibers in legumes and spinach. This soup looks like the perfect comfort food for the cold we are having! I have to give this a try soon! Yes Beth, soups are amazing little helpers to defend colds in a comforting way. I wish you and your family to get well again soon! I think I’ve just found my dinner! So filling and delicious! Thank you Demeter. 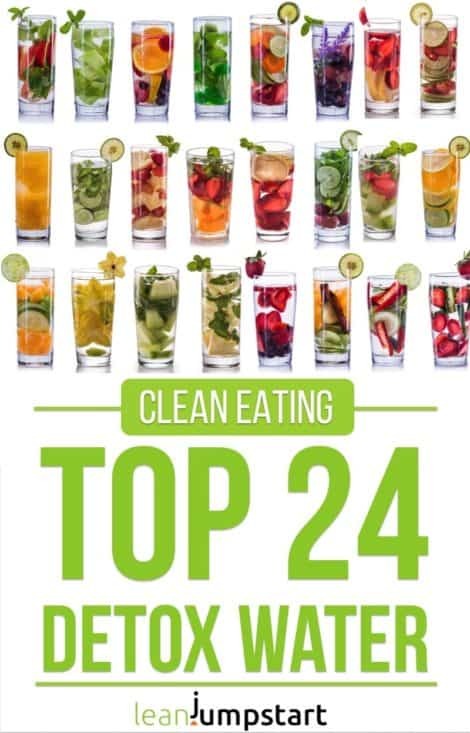 I’m always glad when my easy clean eating recipes can inspire someone to cook a filling meal from scratch at home. Enjoy! This red bean soup looks like the perfect way to end a long cold day. I like that this is quick and easy but also filling at the same time. Thank you, Kelly. Yes, this simple, fiber-rich legume soup is perfect to end a long chilly day. It is ready in a snap and most of its ingredients are staples most of us have anyway at home. I love soup and this looks so good! Using red beans are perfect! Thank you Shanita. If you are a soup lover then this legume dish should not miss in your clean eating soup collection.